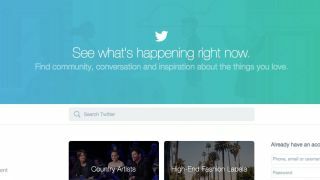 There are big changes afoot at Twitter, which is testing out a totally redesigned home page and several new features. Navigating to Twitter.com when not logged in no longer shows a blank log-in-or-sign-up page, but a collection of curated feeds based on categories like "actors & actresses," "NBA players, teams and personalities," "country artists," "TV shows & stars," and more. The page features over a dozen main categories, plus many more categories and sub-feeds in the lefthand column. The idea is to introduce non-users to interesting content without requiring them to sign up and figure out who to follow, and it's not a bad one. To that purpose Twitter has also introduced another new feature that it hopes will keep people who read individual tweets from leaving the site right away. Some users have begun seeing a column labeled "You may also like" on the pages for individual tweets, Venturebeat reports. A Twitter spokesperson confirmed with the site that it's a feature in testing, but it's not clear how the social network determines on which tweets the column appears and what tweets it shows. Twitter is going to some lengths to get new users to stick around and eventually sign up. As long as it doesn't become any more like Facebook, that's fine by us.